This assignment will account for 30% of your final grade. Does the pendulum consistently convey it's physical properties? Do you meet all the required parameters of the assignment? Is there a clear and convincing sense of mass? Are you effectively using the principles of Timing, Slow In/Out, Arcs, and Overlap and Follow Through? With the grading criteria in front of me, I sketch out a drawing of what I'm going to do for this assignment. As you can see; it doesn't need to be a great drawing, Just something to help me quickly make decisions and keep on track with the assignment. Step 2 ) Animate the root of the Pendulum. Here's my first pass, just animating on the root of the pendulum. I need to work out the timing and mechanics on the root before I can work out the follow through, so I haven't touched the tail yet. Step 3) Animate overlap on segment 1. 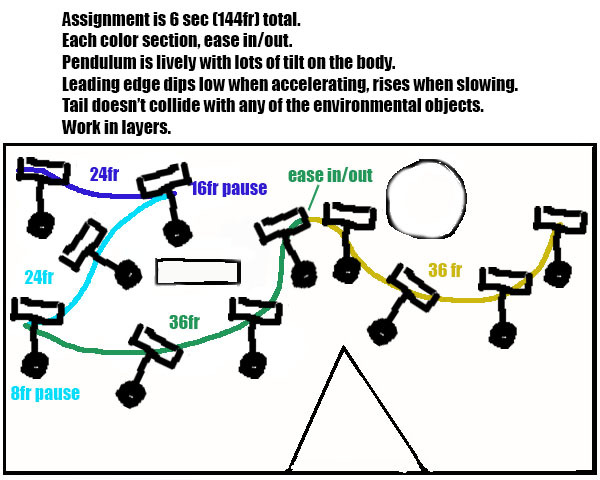 I'm going to work on animating just the first segment of the pendulum tail, and hide the lower parts. I'll use the tool bhGhost to help me see clearly how to animate the tail. Note how the spacing on the end starts slow, easing out from the beginning of the action. The larges spacing will be at the bottom of the swing, where gravity is helping to accelerate the action. 1. Inertia. The tail of the pendulum resists change. It will always try to do whatever it was doing in the previous frame. If it was sitting still, it will try to stay sitting still. If it was in motion, it will try to keep going the same speed, in the same direction. 2. Gravity. I also pay attention to the idea that gravity is constantly pulling the pendulum to a straight down position. In some cases, this will cause the tail to speed up as it tries to return it's default position. If no energy is added by movement from the top, the tail of the pendulum will swing back and forth, losing energy each swing, until it comes to a rest hanging straight down again. A smooth curve doesn't mean smooth movement - the tail is inheriting rotation from the root. Get ready for feedback in the next class. If there are any issues with the first segment of the tail it will cause problems with the animation of the rest of the tail segments. Based on the feedback, make any necessary fixes to the first tail segment. Note how the second tail segment curve is delayed relative to the first segment? That is a big part of overlapping action: some parts of the character trail behind other parts. When I finish the third tail segment, you'll see that it trails behind even more in the graph editor. Step 6) Finish with the last segment of the Tail. Here are what the RotZ curves of all three tail segments look like. This animation looks a bit too active and lively. I may scale some of the actions down a bit to make it feel more like the tail is just lifeless drapery with no motive power of it's own. I've used Edit>Change Curve Color in the graph editor to make this easier to see. That's the entire process! Hopefully you will end up with a nice example of Overlap and Follow Through using this step by step workflow. bhGhost or a similar visualization tool is going to be critical to getting this working well. If it moves too quick back to vertical, it definitely makes the tail feel like it's spring loaded. Try slowing it down by adding frames. Does the tail of your pendulum feel like it's made of silk drapery, blown by the slightest breeze? Fewer frames at the extreme of the swing so that the tail returns to vertical faster and it will feel like air resistance has less effect. Don't hold the tail back as the base of the pendulum moves side to side. The tail will hold back for a few frames, but then it will try to return to vertical by overshooting and recovering.